May 29, 2017 at 02:33 PM | 41 Views | Last edit May 29, 2017 at 02:48 PM 3 rev. 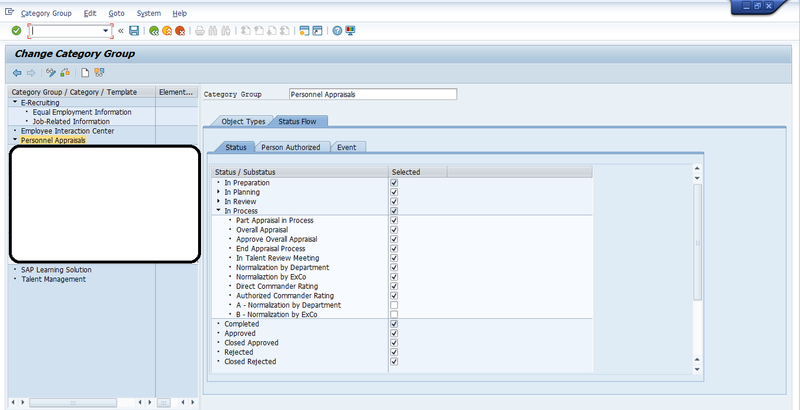 I have activated the status "In Process" and its substatuses at Category Group and Category Levels. But they are showing non-editable at Appraisal Template Level (except Part Appraisal). I need to use these statuses and substatuses to complete the configuration. I think this is probably you have not select the FAPP Final Appraisal column within this template. Please check on that.